Sir Francis Seymour Haden (1818-1910) was an English surgeon, but best known for his skill as an etcher. Haden is considered as the father of the British Etching Revival, and along with his American brother-in-law James Whistler, energized both the public and art collectors by the beauty and creativity of his original etchings. Medium: etching and drypoint. This is Seymour Haden's etched version of the painting by Thomas Wright of Derby entitled "Edwin the Minstrel". The man in the portrait was actually Sir Francis Seymour Haden's own grandfather. This is a very rare first state impression -- before the artist added additional crosshatched drypoint shading at the back of the figure. An additional plate signature would also be added for the second state. There were five different states in all. Catalogue references: Drake 51 and Schneiderman 53. This impression is signed both in pencil and in the plate. Printed on watermarked laid paper, the plate measures 14 x 9 1/2 inches (355 x 242mm). The total sheet measures 17 x 12 1/8 inches (434 x 308mm). Condition: the paper is age-toned and light struck. 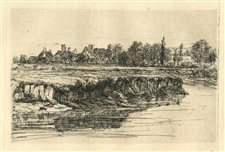 Seymour Haden pencil-signed etching "The Village Ford"
Medium: original etching. Signed both in the plate and in pencil. Catalogue reference Schneiderman 202. Executed in 1881, and printed on laid paper with full margins. Plate size: 7 x 10 1/4 inches (262 x 180 mm). A rich impression with plate tone. Condition: there is foxing, minor creasing, a mat stain and two repaired tears in the margin. Seymour Haden original etching "Twickenham Church"
Medium: original etching with drypoint. Catalogue reference: Schneiderman 98. Executed in 1865; this is a rich, dark impression on laid paper with full original margins from the 1872 edition of "The Portfolio" published in London by Seeley, Jackson & Halliday and edited by 19th Century artist and art critic Phillip Gilbert Hamerton. The plate measures 5 7/16 x 8 7/16 inches (137 x 214 mm). Signed by Seymour Haden in the plate, not by hand. 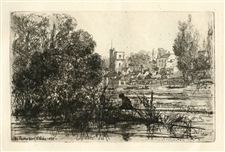 Seymour Haden original etching "Egham Lock"
Medium: original etching. Catalogue reference: Schneiderman 21. Executed in 1859; this very nice impression on thin laid paper is from the Gazette des Beaux Arts edition of 1864. Plate size: 5 7/8 x 8 7/8 inches. Signed by Seymour Haden in the plate, not by hand. Medium: original etching. This impression on Arches laid paper printed in 1880 for Philip Gilbert Hamerton's very scarce "Etching and Etchers", issued in an edition of 1000. Plate size: 5 1/2 x 7 7/8 inches (140 x 200 mm) with good margins. Signed in the plate by Seymour Haden (not by hand). Seymour Haden original etching "Bit of a River Bank"
Medium: original etching. This impression on laid paper was printed in 1868 for Philip Gilbert Hamerton's very scarce first volume of "Etching and Etchers". Image size: 4 x 6 1/4 inches (102 x 157 mm) with an irregular platemark, as printed. Not signed. For collectors of Sir Francis Seymour Haden artwork and prints, AffordableArt101 Fine Prints has an excellent selection of rare Seymour Haden art for sale in our online gallery.